The entries in this year African Folklore Embroidery $500 Challenge, were spectacular. Congratulations to first place winner, Roberta Peterson from Woodland, Washington. Roberta attended an African folklore Embroidery class that I taught at Monica’s quilt and bead shop in Palm Springs and she was hooked. 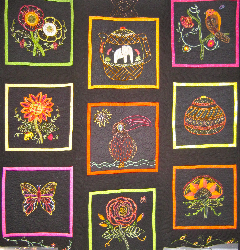 She embroidered nine different kits and them compiled them into a magnificent quilt. I first met second place winner, Carol Cunningham- hutte at a workshop I gave to the Mountain View EGA Chapter. She beautifully embroidered the paisley flower and poppy design and stitched a handbag with a completed design on each side. Become a friend of African Folklore Embroidery by pressing Like. It was wonderful to see all the entries in the booth at the International Quilt Festival in Long Beach. Over 20,000 people attended the show and all were impressed at the standard and quality of the quilts on display.
. You can register for the vendor mall. I will be teaching the following classes at the conference. You can register onsite at the American Sewing Guild Conference. 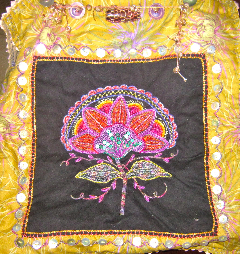 · Fri Aug 19th 2pm Fabric Appliqué with beading the African Folklore Embroidery way. Sun, Sept 11th Workshop hosted by Monterey Peninsula Quilters,10am- 4pm :515 Junipero Street Pacific Grove, CA (831) 484- 1467 Stan2Rita@sbcglobal.net. These are wonderful! Congrats to the winners!